Officials of Platinum Entertainment are currently in The Gambia to prepare the stage for the 2015 edition of Belle of African Nations (BOAN). This was disclosed to journalists yesterday at a press briefing held at the Joint Officers Mess in Kotu. Belle of African Nations is a Pan-African beauty pageant organised by Platinum Entertainment based in Nigeria. 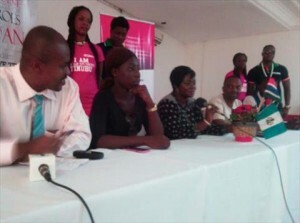 In her statement to the media, Platinum Entertainment’s CEO Olayinka Fatima Edu said their visit to The Gambia was unique, in the sense that they have brought to The Gambia “an experience that is common yet new, a tradition that is familiar yet unfamiliar”. “In the spirit of brotherhood or sisterhood, Platinum Entertainment Nigeria is organizing a Pan-African Beauty Pageant: Belle of African Nations (BOAN),” Ms Edu said, whilst giving a brief background of her organization. Platinum Entertainment Nigeria Limited is a Lagos-based organization that started years ago, with the aim of giving quality and precise information services and combining ideas to match international standard anywhere in the world and become the biggest entertainment house in Africa, Ms Edu added. With a time-tested team of young talented and creative minds, Platinum Entertainment crew “are simply dedicated and trained to serve the public” through their unique initiatives. Ms Olayinka Fatima Edu said there is a huge growth in the entertainment industry, hence the need for proper management/ structures. “We are keen to unveiling our wonderful and unique initiatives to the world through this medium, because life would be just too boring and worrisome without entertainment,” she remarked, adding that Belle of African Nations is the first of its kind as a socio-cultural Pan-African Beauty Pageant that aims to identify with the unforgettable legacies of African historical heroines, by publicizing their lives, times, struggles, challenges and victories to the world through entertainment, in such a way that “beauty and brains are modeled to birth the heroines of our time”. The participants from all the African countries at the 2015 edition of BOAN will congregate in The Gambia from where they will take off to Lagos Nigeria, Ms Edu said. “Our choice of The Gambia as a take-off point was informed by the fact that Gambia, as a nation, is very peaceful,” she added. Speakers at the press briefing included Binta Janneh and Mr Wilfred Adams, both from Afrinity Productions. They thanked the team from Nigeria for choosing The Gambia to assemble all the participants from other African countries, before taking off for the event in Nigeria.